By exploring the role of military officers and chronicling the sequences of events, Soldiers and Politics in Southeast Asia offers insight into the conditions that fostered military governments specifically in Thailand, Burma, South Vietnam, Indonesia, and Cambodia. Critically comparing these case studies and statistics, this volume provides readers with a deeper understanding of the causes and consequences of military involvement in the region's politics during the post-colonial period covered.Two ideologically opposed positions evolved around the phenomenon of military insurgency. Technological conservatism generally favors military insurgency in previously civilian-led governments. There was a presumption that it encourages stability, efficiency, and anti-communism. The revisionist position, on the other hand, was highly critical of technological conservatism, especially with regard to its political fervor. J. Stephen Hoadley asserts that the relevant question is not one of ideological choices; rather, it is whether a military or civilian-led government is better suited for the political and economic development of a particular underdeveloped nation. Hoadley argues that there is little difference between military and civilian-led governments in their abilities to establish stability and maintain law.The book concludes that neither conservative nor radical views are fully correct as to the effects of military-led governments on development. 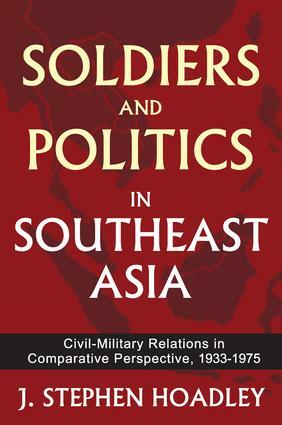 Soldiers and Politics in Southeast Asia focuses exclusively on civil-military politics in Southeast Asia in a critical period for the region, and it should be read by all individuals interested in Southeast Asian politics and development long after Cold War issues have come to a close.